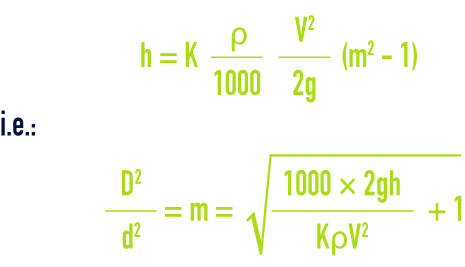 m = ratio between the pipe section and the section of the liquid stream at maximum throttling. for a sharp edged diaphragm [sic] where the aperture diameter d is expressed using the same unit as the internal pipeline diameter D.
Refer to standards ISO 5167-1 to ISO 5167-4. Diaphragms, nozzles and venturi nozzles must be mounted on a straight pipeline where the length of the upstream portion is equal to at least 10D and the downstream portion length greater than 5D, these minimum figures being increased in the case of slight throttling. 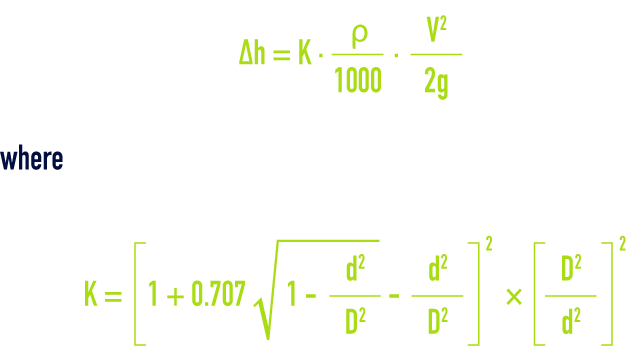 In the case of the classic venturi, the minimum upstream straight section is only 1.5 to 6 D, depending on the amount of throttling (ISO 5167‑1 standard). The length of the venturi tube is established standardised coefficients (see standard above) and by the choice of constriction D - d.